The Botvac D7 Connected is Neato’s smartest, most powerful robot vacuum that adapts to your home for the most convenient and personalized clean. With Neato’s most advanced brush system, Ultra Performance Filter, and the best connectivity (including 5GHz Wi-Fi), this clever wonder keeps floors free of dirt, hair, fur, and allergens. The exclusive LaserSmart™ technology maps and remembers your home’s unique layout to navigate up to 5000 square feet with greater precision. This means more thorough coverage, 4x faster cleaning, and greater care around furniture, even in the dark. Neato’s distinct D-shape design allows the Botvac D7 Connected to get deep into corners and close to walls, unlike round robots. It tackles an entire floor with ease and automatically recharges. Get clean floors every day, even when you’re not home. Start, stop, or pause cleaning sessions with the Neato app for iOS and Android devices. Or control your Botvac D7 Connected with Amazon Alexa, Google Home, Neato Chatbot for Facebook, or IFTTT. 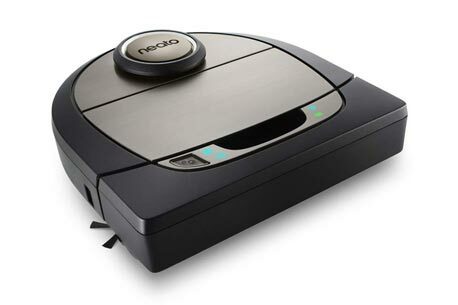 Even use your smartphone to view a map of where the Neato robot has been, and set a cleaning schedule. And only the Botvac D7 Connected lets you set virtual ‘No-Go’ Lines around places you want the Neato robot to avoid, right from your smartphone.